Yes, it does, and sometimes smaller is better. Here's why...the other day I was "doing" some analysis, trying to develop some situational awareness from an image of a Windows 2008 SP2 system. To do so, I extracted data from the image...directory listing of the partition via FTK Imager, Windows Event Logs, and Registry hive files. I then used this data to create a micro-timeline (one based on limited data) so that I could just get a general "lay of the land", if you will. One of the things I did was open the timeline in Notepad++, run the slider bar to the bottom of the file, and search (going "up" in the file) for "Security-Auditing/". I did this to see where the oldest event from the Security Event Log would be located. 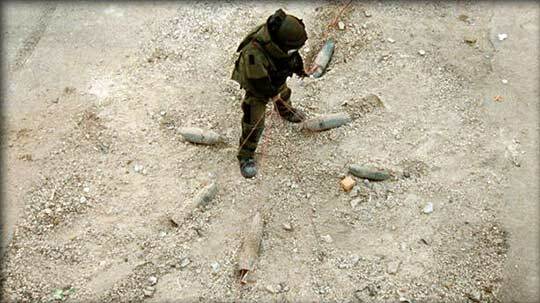 Again, I was doing this for situational awareness. Just to keep track, from the point where I had the extracted data sources, I was now just under 15 min into my analysis. The next thing I did was go all the way back to the top of the file, and I started searching for the tags included in eventmap.txt. I started with "[maldetect]", and immediately found clusters of malware detections via the installed AV product. Still under 18 min at this point. Then I noticed something interesting...there was as section of the timeline that had just a bunch of failed login attempts (Microsoft-Windows-Security-Auditing/4625 events), all of them type 10 logins. I knew that one of the things about this case was unauthorized logins via Terminal Services, and seeing the failed login attempts helped me narrow down some aspects of that; specifically, the failed login attempts originated from a limited number of IP addresses, but there were multiple attempts, many using user names that didn't exist on the system...someone was scanning and attempting to brute force a login. From there, I wrote a quick script that ran through the sec_events.txt file and gave me a count of how many times various system names and IP addresses appeared together. From the output of the script, I could see that for some system names, ones that were unique (i.e., "Hustler", etc., but NOT "Dell-PC") were all connecting from the same range of IP addresses. From the time that I had the data available, to the point where I was looking at the output of the script was just under 45 min. Some of that time included noodling over how best to present what I was looking for, so that I didn't have to go through things manually...make the code do alphabetical sorting rather than having to it myself, that sort of thing. The point of all this is that sometimes, you don't need a full system timeline, using all of the available data, in order to make headway in your analysis. Sometimes a micro-timeline is much better, as it doesn't include all the "noise" associated with a bunch of unrelated activity. And there are times when a nano-timeline is a vastly superior resource. As a side note, after all of this was done, I extracted the NTUSER.DAT files for the two user profiles of interest from the image, added the UserAssist information from each of them to the main events file, and recreated the original timeline with new data...total time to do that was less than 10 min, and I was being lazy. That one small action really crystallized the picture of activity on the system. type events.txt | find "Security-Auditing/4624" | find "admin123" | find ",10"
Okay, my last post really doesn't seem to have sparked too much interest; it went over like a sack of hammers. Too bad. Personally, I thought it was pretty fascinating, and can see the potential for additional work further on down the road. I engaged in the work to help develop a clearer threat intel picture, and there has simply been no interest. Oh, well. Not long ago, I found this pretty comprehensive post regarding malicious Office documents, and it covers both pre- and post-2007 formats. At one point in my career, I was a security admin in an FTE position within a company. One of the things I was doing was mapping the infrastructure and determining ingress/egress points, and I ran across a system that actually had persistent routes enabled via the Registry. As such, I've always tried to be cognizant of anything that would redirect a system to a route or location other than what was intended. For example, when responding to an apparent drive-by downloader attack, I'd be sure to examine not only the web history but also the user Favorites or Bookmarks; there have been several times where doing this sort of analysis has added a slightly different shade to the investigation. Other examples of this include things like modifications to the hosts file. Windows uses the hosts file for name resolution, and I've used this in conjunction with a Scheduled Task, as a sort of "parental control", leaving the WiFi up after 10pm for a middle schooler, but redirecting some sites to localhost. Using that knowledge over the years, I've also examined the hosts file for indicators of untoward activity; I even had a plugin for the Forensic Scanner that would automatically extract any entries in the hosts file what was other than the default. Pretty slick. Not new...this one is over four years old...but I ran across this post on the NetSec blog, and thought that it was worth mentioning. Sometimes, you just have to know what you're looking for when performing incident response, and sometimes what you're looking for isn't in memory, or in a packet capture. I thought this was pretty interesting, not something I'd seen or thought of before. Unfortunately, many of the malware RE folks I know are focused more on the network than the host, so things such as modifications of Registry values tend to fall through the cracks. However, if you're running Carbon Black, this might make a pretty good watchlist item, eh? I did a search and found a malware sample described here that exhibits this behavior, and I found another description here. Hopefully, that might provide some sort of idea as to how pervasive this artifact is. @DanielleEveIR had another interesting tweet, stating that if your app makes a copy of itself and then launches the copy, it might be malware. Okay, she's starting to sound like the Jeff Foxworthy of IR..."you might be malware if..."...but she has a very good point. Our team recently saw the LaZagne credential theft tool being run in an infrastructure, and if you've ever seen or tested this, that's exactly what it does. This would make a good watchlist item, as well...regardless of what the application name is, if the process name is the same as the parent process name, flag that puppy! You can also include this in any script that you use that parses Security Event Logs (for event ID 4688) or Sysmon Event Logs. There've been a number of blog posts that have discussed analyst bias when it comes to DFIR, threat intel, and attribution. Something that I haven't seen discussed much is blue team or defender bias. Wait...what? What is "defender bias"? Let's look at some examples...you're sitting in a meeting, discussing an incident that your team is investigating, and you're fully aware that you don't have all the data at this point. You're looking at a few indicators, maybe some files and Windows Event Log records, and then someone says, "...if I were the bad guy, I'd...". Ever have that happen? Being an incident responder for about 17 years, I've heard that phrase spoken. A lot. Sometimes by members of my team, sometimes by members of the client's team. Another place that defender bias can be seen is when discussing "crown jewels". One of the recommended exercises while developing a CSIRP is to determine where the critical data for the organization is located within the infrastructure, and then develop response plans around that data. The idea of this exercise is to accept that breaches are inevitable, and collapse the perimeter around the critical data that the organization relies on to function. But what happens when you don't have the instrumentation and visibility to determine what the bad guy is actually doing? You'll likely focus on protected that critical data while the bad guy is siphoning off what they came for. The point is that what may be critical to you, to your business, may not be the "crown jewels" from the perspective of the adversary. Going back as far as we can remember, reports from various consulting organizations have referred to the adversary as having a "shopping list", and while your organization may be on that list, the real question isn't just, "..where are your critical assets? ", it's also "...what is the adversary actually doing?" What if your "crown jewels" aren't what the adversary is after, and your infrastructure is a conduit to someone else's infrastructure? What if your "crown jewels" are the latest and greatest tech that your company has on the drawing boards, and the adversary is instead after the older gen stuff, the tech shown to work and with a documented history and track record of reliability? Or, what if your "crown jewels" are legal positions for clients, and the adversary is after your escrow account? My point is that there is going to be a certain amount of defender bias in play, but it's critical for organizations to have situational awareness, and to also realize when there are gaps in that situational awareness. What you decide are the "crown jewels", in complete isolation from any other input, may not be what the adversary is after. You'll find yourself hunkered down in your Maginot Line bunkers, awaiting that final assault, only to be mystified when it never seems to come. 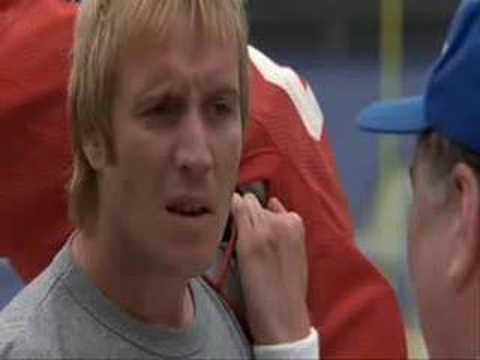 Okay, if you've never seen The Replacements then the title of this post won't be nearly as funny to you as it is to me...but that's okay. I recently posted an update blog that included a brief discussion of a tool I was working on, and why. In short, and due in part to a recently publicized change in tactics, I wanted to dust off some old code I'd written and see what information or intel I could collect. The tactic I'm referring to involves the use of malware delivered via '.pub' files. 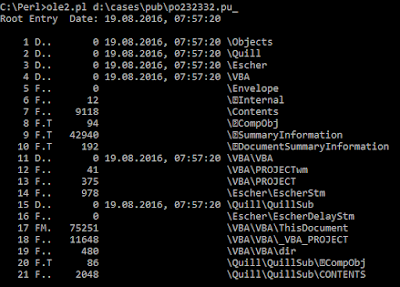 I wasn't entirely too interested in this tactic until I found out that .pub (MS Publisher) files are OLE format files. The code I'm referring to is wmd.pl, something I wrote a while back (according to the header information, the code is just about 10 yrs old!) and was written specifically to parse documents created using older versions of MS Word, specifically those that used OLE. 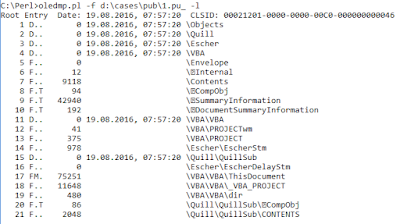 The Object Linking and Embedding (OLE) file format is pretty well documented at the MS site, so I won't spend a lot of time discussing the details here. However, I will say that MS has referred to the file format as a "file system within a file", and that's exactly what it is. If you look at the format, there's actually a 'sector allocation table', and it's laid out very similar to the FAT file system. Also, at some levels of the 'file system' structure, there are time stamps, as well. Now, the exact details of when and how these time stamps are created and/or modified (or if they are, at all) isn't exactly clear, but they can serve as an indicator, and something that we can incorporate with other artifacts such that when combining them with context, we can get a better idea of their validity and value. For most of us who have been in the IR business for a while, when we hear "OLE", we think of the Blair document, and in particular, the file format used for pre-2007 versions of MS Office documents. Further, many of us thought that with the release of Office 2007, the file format was going to disappear, and at most, we'd maybe have to dust off some tools or analysis techniques at some point in the future. Wow, talk about a surprise! Not only did the file format not disappear, as of Windows 7, we started to see it being used in more and more of the artifacts we were seeing on the system. Take a look at the OLE Compound File page on the ForensicWiki for a list of the files on Windows systems that utilize the OLE file format (i.e., StickyNotes, auto JumpLists, etc.). So, rather than "going away", the file format has become more pervasive over time. This is pretty fascinating, particularly if you have a detailed understanding of the file structure format. In most cases when you're looking at these files on a Windows system, the contents of the files will be what you're most interested in; for example, with automatic Jump Lists, we may be most interested in the DestList stream. However, when an OLE compound file is created off of the system, perhaps through the use of an application, we (as analysts) would be very interested in learning all we can about the file itself. So, the idea behind the tool I was working on was to pull apart one component of the overall attack to see if there were any correlations to the same component with respect other attacks. I'm not going to suggest it's the same thing (because it's not) but the idea I was working from is similar to pulling a device apart and breaking down its components in order to identify the builder, or at the very least to learn a little bit more that could be applied to an overall threat intel picture. Here's what we're looking at...in this case, the .pub files are arriving as email attachments, so you have a sender email address, contents of the email header and body, attachment name, etc. All of this helps us build a picture of the threat. Is the content of the email body pretty generic, or is it specifically written to illicit the desired response (opening the attachment) from the user to whom it was sent? Is it targeted? Is it spam or spear-phishing/whaling? Then we have what occurs after the user opens the attachment; in some cases, we see that files are downloaded and native commands (i.e., bitsadmin.exe) are executed on the system. Some folks have already been researching those areas or aspects of the overall attacks, and started pulling together things such as sites and files accessed by bitsadmin.exe, etc. Some of the files had a populated "Authress:" entry in the SummaryInformation section. However, with the exception of those files, the SummaryInformation and DocumentSummaryInformation streams were blank. All of the files had Trash sections (again, see the document structure specification) that were blank. For example, in the image to the left, we see the tool listing the Trash sections and their sizes; for each file examined, the File Space section was all zeros, and the System Space section was all "0xFFFF". Without knowing more about how these sections are managed, it's difficult to determine specifically if this is a result of the file being created by whichever application was used (sort of a 'default' configuration), or if this is the result of an intentional action. Many (albeit not all) files contained a second stream with an embedded macro. In all cases within the sample set, the stream was named "Module1", and contained an empty function. However, in each case, that empty function had a different name. Some of the streams of all of the files were identical across the sample set. 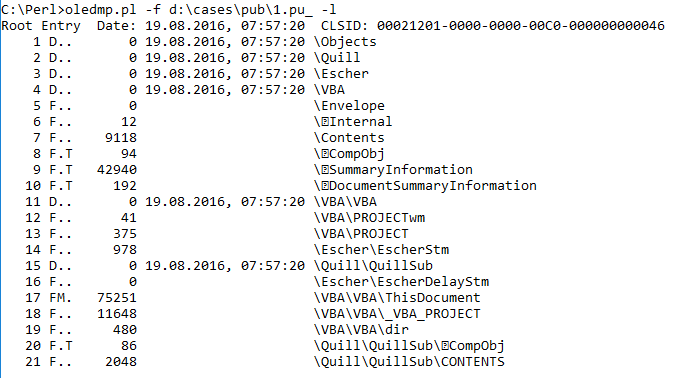 For example, the \Quill\QuillSub\ \x01CompObj stream for all of the files appears as you see in the image below. All in all, for me, this was some pretty fascinating work. I'm sure that there may be even more information to collect with a larger sample set. In addition, there's more research to be done...for example, how do these files compare to legitimate, non-malicious Publisher files? What tools can be used to create these files? Mari had a great post recently that touched on the topic of timelines, which also happens to be the topic of her presentation at the recent HTCIA conference (which, by all Twitter accounts, we very well received). A little treasure that Mari added to the blog post was how she went about modifying a Volatility plugin in order to create a new one. Mari says in the post, "...nothing earth shattering...", but you know what, sometimes the best and most valuable things aren't earth shattering at all. In just a few minutes, Mari created a new plugin, and it also happens to be her first Volatility plugin. She shared her process, and you can see the code right there in the blog post. Speaking of sharing..well, this has to do with DFIR in general, but not Windows specifically...I ran across this fascinating blog post recently. In short, the author developed a means (using Python) for turning listings of cell tower locations (pulled from phones by Cellebrite) into a Google Map. A while back, I'd written and shared a Perl script that did something similar, except with WiFi access points. The point is that someone had a need and developed a tool and/or process for (semi-)automatically parsing and processing the original raw data into a final, useful output format. I ran across this ISC Handler Diary recently...pretty interesting stuff. Has anyone seen or looked at this from a process creation perspective? The .pub files are OLE compound "structured storage" files, so has anyone captured information from endpoints (IRL, or via a VM) that illustrates what happens when these files are launched? For detection of these files within an acquired image, there are some really good Python tools available that are good for generally parsing OLE files. For example, there's Didier's oledump.py, as well as decalage/oletools. 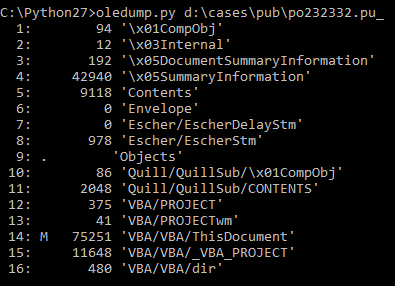 I really like oledump.py, and have tried using it for various testing purposes in the past, usually using files either from actual cases (after the fact), or test documents downloaded from public sources. A while back I wrote some code (i.e., wmd.pl) specifically to parse OLE structured storage files, so I modified that code to essentially recurse through the OLE file structure, and when getting to a stream, simply dump the stream to STDOUT in a hex-dump format. However, as I'm digging through the API, there's some interesting information available embedded within the file structure itself. So, while I'm using Didier's oledump.py as a comparison for testing, I'm not entirely interested in replicating the great work that he's done already, as much as I'm looking for new things to pull out, and new ways to use the information, such as pulling out date information (for possible inclusion in a timeline, or inclusion in threat intelligence), etc. 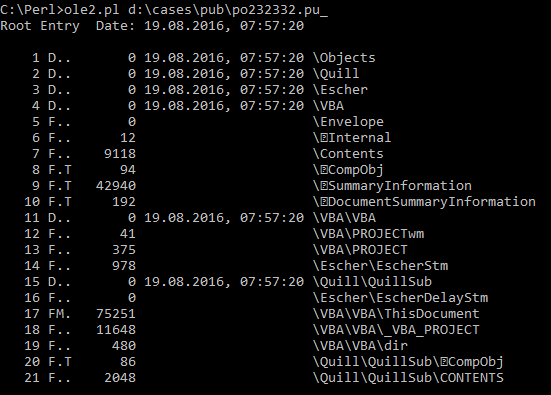 So I downloaded a sample found on VirusTotal, and renamed the local copy to be more inline with the name of the file that was submitted to VT.
As you can see, there are more than a few differences in the outputs, but that doesn't mean that there's anything wrong with either tool. In fact, it's quite the opposite. Oledump.py uses a different technique for tracking the various streams in the file; ole2.pl uses the designators from within the file itself. - the "type" (from here); basically, is the property a PropertySet? Part of the reason I wrote this script was to see which sections within the OLE file structure had dates associated with them, as perhaps that information can be used as part of building the threat intel picture of an incident. The script has embedded code to display the contents of each of the streams in a hex-dump format; I've disabled the code as I'm considering adding options for selecting specific streams to dump. Both tools use the same technique for determining if macros exist in a stream (something I found at the VBA_Tools site). One thing I haven't done is added code to look at the "trash" (described here) within the file format. I'm not entirely sure how useful something like this would be, but hey, it may be something worth looking at. There are still more capabilities I'm planning to add to this tool, because what I'm looking at is digging into the structure of the file format itself in order to see if I can develop indicators, which can then be clustered with other indicators. For example, the use of .pub file attachments has been seen by others (ex: MyOnlineSecurity) being delivered via specific emails. At this point, we have things such as the sender address, email content, name of the attachment, etc. Still others (ex: MoradLabs) have shared the results of dynamic analysis; in this case, the embedded macro launching bitsadmin.exe with specific parameters. Including attachment "tooling" may help provide additional insight into the use of this tactic by the adversary. Something else I haven't implemented (yet) is extracting and displaying the macros. According to this site, the macros are compressed, and I have yet to find anything that will let me easily extract and decompress a macro from the stream in which its embedded, using Perl. Didier has done it in Python, so perhaps that's something I'll leave to his tool. I read this rather fascinating Cisco Continuum article recently, and I have to say, I'm still trying to digest it. Part of the reason for this is that the author says some things I agree with, but I need to go back and make sure I understand what they're saying, as I might be agreeing while at the same time misunderstanding what's being said. Where a team like Cisco’s Talos and products like AMP or SourceFire really has the advantage, Reid said, is in automating a lot of these processes for customers and applying them to security products that customers are already using. That’s where the future of threat intelligence, cybersecurity products and strategies are headed. Regardless of the team or products, where we seem to be now is that processes are being automated and applied to devices and systems that clients are already using, in many cases because the company sold the client the devices, as part of a service. Pretty fascinating to have an entry added to a plugin 3 1/2 years ago still be of value today. Speaking of the Registry, I saw a tweet recently indicating that the folks at Volatility had updated the svcscan module to retrieve the service setting for what happens when the services fails to start. This is pretty interesting...I haven't seen this value having been set or used during an engagement. However, I am curious...what Windows Event Log record is generated when a service fails to start? Is there more than one? According to Microsoft, there are a number of event IDs related to service failures of various types. The question is, is there one (or two) in particular that I should look for, with respect to this Registry value? For example, if I were creating a timeline of system activity and included the contents of the System Event Log, which event IDs (likely from source "Service Control Manager") would I be most interested in, in this case? Jamie (@gleeda) recently RT'd an interesting tweet from MWR Labs regarding a tool that they'd created to set malicious Outlook rules for persistence. I was going to say, "hey, this is pretty fascinating...", but I can't. Here's why...SilentBreak Security talked about malicious Outlook rules, as have others. In fact, if you read the MWRLabs blog post, you'll see that this is something that's been talked about and demonstrated going back as far as 2008...and that's just the publicly available stuff. Imagine compromising an infrastructure and leaving something in place that you could control via a text message or email. Well, many admins would look at this and think, "well, yeah, but you need this level of access, and you then have to have this..."...well, now it's just in a single .exe file, and can be achieved with command line access. I know, this isn't the only way to do this...and apparently, it's not the only tool available to do it, either. However, it does represent a means for retaining access to a high-value infrastructure, even following eviction/eradication. Imagine working very hard (and very long hours) to scope, contain, and clean up after a breach, only to have the adversary return, seemingly at will. And to make matters even more difficult, the command used could easily include a sleep() function, so it's even harder to tie back the return to the infrastructure to a specific event without knowing that the rule exists. Doing threat hunting and threat response, I see web shells being used now and again. I've seen web shells as part of a legacy breach that predated the one we were investigating, and I've seen infrastructures rife with web shells. I've seen a web shell used internally within an infrastructure to move laterally (yeah, no idea about that one, as to "why"...), and I've seen where an employee would regularly find and remove the web shell but not do an RCA and remediate the method used to get the web shell on the system; as long as the vulnerability persists, so does the adversary. I caught this pretty fascinating description of a new variant of the China Chopper web shell, called "CKnife", recently. I have to wonder, has anyone else seen this, and if so, do you know what it "looks like" if you're monitoring process creation events (via Carbon Black, Sysmon, etc.) on the system? Eric Zimmerman recently shared the results of some pretty extensive tool testing via his blog, and appeared on the Forensic Lunch with David and Matt, to discuss his testing. I applaud and greatly appreciate Eric's efforts in putting this together...it was clearly a great deal of work to set the tests up, run them, and then document them. I am, however, one of those folks who won't find a great deal of value in all of that work. I can't say that I've done, or needed to do, a keyword search in a long time. When I have had to perform a keyword search, or file carving, I tend to leave long running tasks such as these for after-hours work, so if it finishes in 6 1/2 hrs, or 8 hrs, really isn't too big a deal for me. A great deal of the work that I do involves creating timelines of all sizes (Mari recently gave a talk on creating mini-timelines at HTCIA). I've created timelines from just the contents of the Security Event Log, to using metadata from multiple sources (file system, Windows Event Logs, Registry, etc.) from within an image. If I need to illustrate how and when a user account was used to log into a system, then download and view image files, I don't need a full commercial suite to do this...and a keyword search isn't going to give me any thing of value. That's not to say that I haven't looked for specific strings. However, when I do, I tend to take a targeted approach, extracting the data source (pagefile, unallocated space, etc.) from the image, running strings, and then searching for specific items (strings, substrings, etc.) in the output. Again...and don't misunderstand...I think that what Eric did was some really great work. He would not have done it if it wasn't of significant value to him, and I have no doubt in my mind that he shared it because it will have significant value to others.